Originally from Perth, in Scotland, Beverley studied Plant and Environmental Biology at the University of St Andrews before a PhD in Plant Developmental Genetics at the John Innes Centre in Norwich. 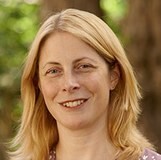 She established her research group at the University of Cambridge in 1999, where she is also a Fellow of Queens’ College. Since 2013 Beverley has been Director of the Cambridge University Botanic Garden and Professor of Plant Systematics and Evolution. Her research is focused on the development, function and evolution of floral features which enhance pollination success. This work is important because the enormous species diversity of the flowering plants can be attributed, at least in part, to the reproductive isolation resulting from the recruitment of animals as pollen vectors. This understanding also underpins research into security of animal-pollinated food crops, providing opportunities to support plant breeders in their efforts to optimize yields of key crops.